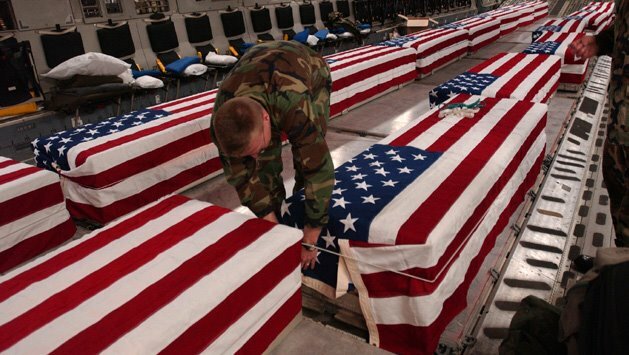 Here are some photographs President Bush, Vice President Cheney and others in the current administration do not want you to see. It reminds us of the reality of war in Iraq. How the power of the "surge" only temporarily rescinded violence to spur the Iraqi government to negotiate a peace settlement - which it has not. 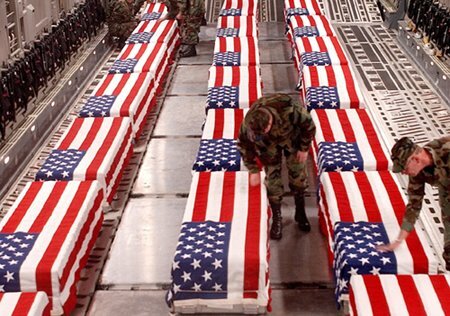 How our military is being decimated by the war in Iraq. How our economy is imploding in large part due to the Iraq war, yadda yadda yadda. 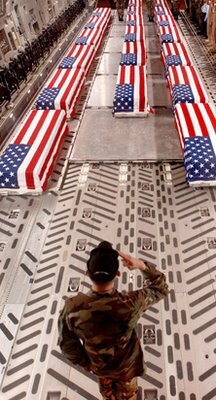 This happens daily - bodies of US soldiers and civilians killed in Iraq coming home draped in flags. Cheney today echoed what other Republican politicians have said: volunteer soldiers sign up for this duty, knowing that this could well be the outcome. As in, volunteers sign up to die. Personally, I believe all flags throughout the US should be flown at half mast, recognizing the daily death toll taken by the war in Iraq. This does not even take into account the reported hundreds of thousands of innocent Iraqis - children, women and men - who have been caught in the middle and killed because the US President/Vice President pushed us into a war with a soverign nation that did not have weapons of mass destruction, al queda, or any of the untruthful "threats" they insisted Iraq posed to our nation. Meanwhile, al queda is licking its chops, growing all over the world while the US breaks its military and banks in Iraq, insisting that we're fighting the few al queda members in Iraq so we don't have to "fight them here." There is no small cell of al queda. They are in every nation, and they are succeeding in some of their goals: to break the US economically; to drain our military; to scare us into misdirecting our security efforts in places that are wasteful and ignorant. I do believe Western nations are facing a threat from terrorists - who are not in Iraq. Why is it every other nation seems to know and understand this except the United States? Honestly, sometimes I wonder whose side Bush and Cheney are actually on. Other than Senator John McCain's. What a brutal, bloody, expensive, wasteful shame. 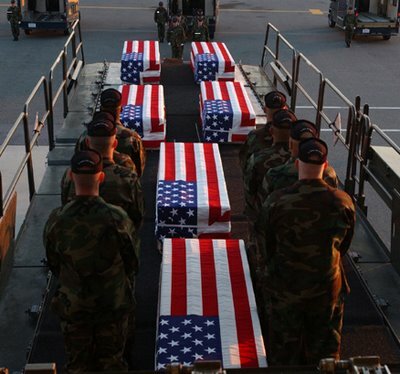 Rest in peace, courageous heroes who have given your lives for our nation, knowing your civilian leaders would never do the same, even if there were no "volunteer" military force.